This pdf is 3 pages long, 1 page front cover, 1 page SRD, leaving us with 1 page of content, so let's take a look, shall we? -Expert Aid: Use aid another via reach weapons; Add mythic tier to aid another attack-rolls and 1/2 mythic tier to the aid another bonus. Okay, I guess, but not too exciting. -Teamwork Feat Mastery: Train one hour and spend one mythic power for +1 bonus teamwork feat; at 4th level, you can get 1/2 mythic tier of these wildcard teamwork feats. At 6th level, you can spend 2 uses of mythic power to cut training down to 1 minute. Usually, I'd complain about wildcard feats, but seeing that Teamwork feats aren't that numerous or powerful, I can live with this one. -Unbroken Will: React with +2 to atk and saves after being affected by intimidate or a mind-influencing effect. If the effect would penalize atk or saves, suspend these penalties for one round. Additionally, non-mythic characters that prompt this ability via intimidate/mind-influence are flat-footed in this one round against you, whereas mythic adversaries get a sense motive-check against your bluff. I assume that the bluff-check is a free action here. At 4th level, you can use mythic power to confer this ability to an ally -does the marshal use the ability as it's conferred or not? At 8th level, all allies within 30 foot may benefit from this for two uses of mythic power - the question remains: Is the ability retained by the marshal? I'm honestly not sure. Also: I don't understand why the target is flat-footed against you for more than one attack. -Conflicting Orders: When someone within 30 feet uses aid another, handle animal or a teamwork feat, you may negate this bonus as an immediate action. What about two characters acting at the same time using their teamwork feats? Does negating the benefit of one also cancel out the other? This works automatically for non-mythic creatures and those of a mythic tier below yours. You may also spend one use of mythic power to make a level-check versus caster level check (Why not against a fixed value? PFRPG usually uses a check versus fixed value mechanic, not competing d20-rolls...) to undermine the magical orders of charms/dominations etc. You may counter the orders of multiple creatures (mythic tier creatures) by expending 2 uses of mythic power. This second use of the ability should probably be a mind-influencing effect, which it as written, is not. -Friendly Flanking: You always count as flanking when adjacent to an enemy with an ally, you don't have to be on the opposite side of the enemy. Spend 1 use of mythic power to share this with 1/2 mythic tier allies for 1 minute. Rather powerful...I'm not 100% comfortable with this one - add squads of rogues = PAIN. -Resurging Speech: Use Resurging Words as a full-round action. If you speak for 1 minute, you can remove the fatigued condition and may heal hit points instead of granting temporary hit points. When spending 10 minutes, you may instead remove the exhausted condition and heal damage as well as grant mythic tier+ cha-mod temporary hit points. This one is actually rather cool, making a per se weak 1st tier choice work better at higher levels. Editing and formatting are top-notch, I didn't notice any glitches. Layout adheres to Legendary Games beautiful 2-column standard and the pdf comes sans bookmarks, but needs none at this length. 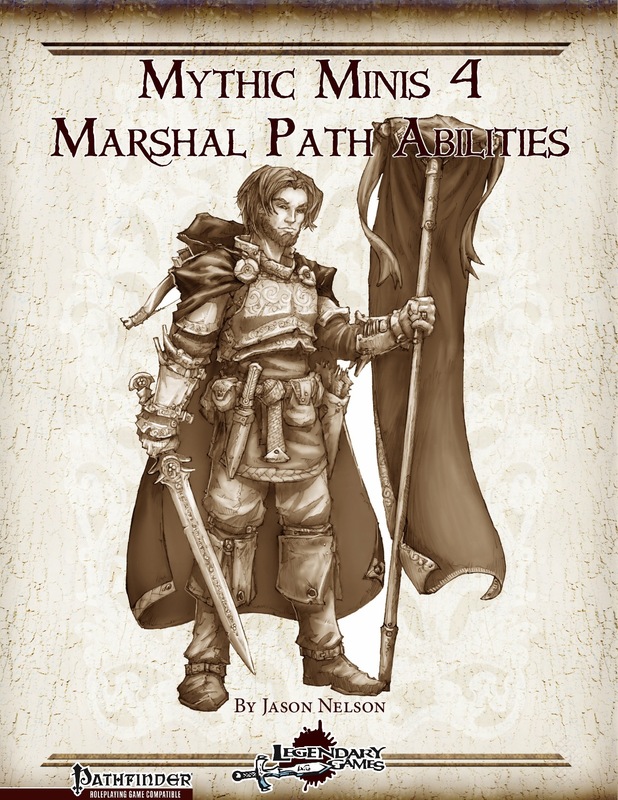 Jason nelson delivers the second expansion of path-abilities - and while these are better than the ones the champion got, I am not 100% sold on quite a few of them and overall, there are wordings that could use some slight specification. that being said, this is by no means bad - hence my final verdict will clock in at a solid 3 stars. Solid, but not required. The fourth entry in Legendary Games Mythic Minis line is a perfectly themed expansion to the Mythic Marshall Path. The abilities within are thematically appropriate to the Marshall's role as the unbeatable combat coordinator and really add functional and flavorful options to the paths already enviable capabilities. The abilities contained within include: Expert Aid, Teamwork Feat Mastery, Unbroken Will, Conflicting Orders (my personal favorite), Friendly Flanking, Shatter Resistance & Resurging Speech. And, believe me, they are definitely mythic! The PDF's production quality is, as usual, immaculate. The bang-for-your-literal-buck is practically unbeatable. All-in-all this is definitely another feather in the Legendary Design Teams cap. Grab yourself a copy today. You will not be disappointed. By the might of MYTHIC MONDAYS, we bring you the latest from Legendary Games! Excellent work. Nice abilities, may even think about playing a marshal now. So when do we get the next mythic creatures book - the inner planes one? It's not that I'm greedy for mythic goodness but...well I am. Thanks for the kudos on this one. As for Mythic Monsters: Inner Planes, it's available right now on our website! It will also be available here at Paizo, DrivethruRPG, and shop.d20pfsrd tomorrow! Any chance we can get a list of the new abilities, to help decide if we need them? Check out Weslocke's review - he lists them all. Reviewed first on ENdzeitgeist.com, then submitted to Nerdtrek and GMS magazine, posted here, on OBS and d20pfsrd.com's shop.